I've been pretty quiet on this blog for the last few weeks. It wasn't because nothing was happening with my book proposal; it was actually quite the opposite. Long story short ? I just became a professional author today by signing a book deal - hopefully my first book deal. The long story of what happened over the last few weeks to get to today was pretty interesting though, so here goes. I think my last posting was that another very big publishing house was about to make us an offer for the book. The good news was that they did. The editorial guy there (I think I pseudo-named him "Ford' in my last post) successfully pitched it to his editorial board. The bad news was that the darn MBAs then got involved. "Finance is telling me I need to add in a buyback for them to sign off," Ford emailed us, "could you guys do (insert number here)?" What the heck is a buyback I thought? Wasn't there a movie called Buyback Mountain? Or maybe it was the Buyback of Notre Dame. Is that what that Chili's commercial about its ribs says ? "I want my buyback, buyback, buyback, buyback? I want my buyback, buyback, buyback, buyback?" Well, the definition "buyback" is more akin to a horror movie than delicious barbeque. 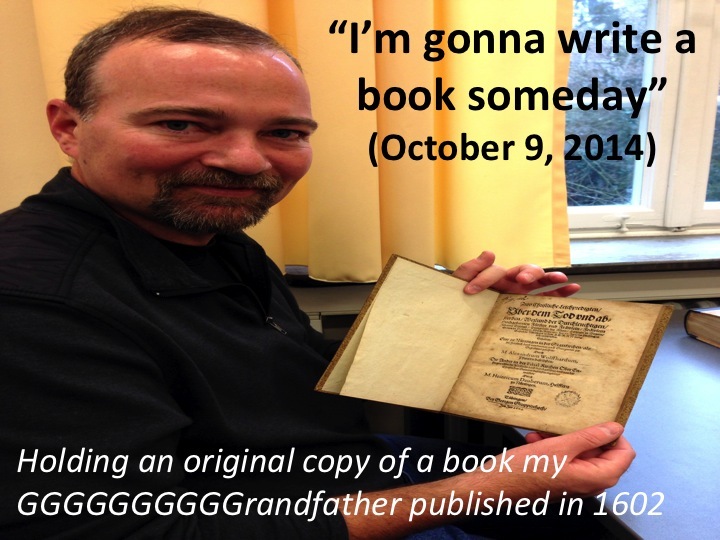 It basically means the author agrees to buy a set number of the book copies and sell them himself. If the author doesn't sell them, he ends up with his advance and royalties kaput and his basement looking like the Texas School Book Depository. In short, it shifts part of the financial risk that publishers traditionally take in signing a new author and paying him an advance as well as incurring all the editorial, printing, and marketing costs it takes to get books published. Publishers typically say their costs are in the six figures to get a book into stores, so I get why they would want to offload any of that risk they could. (I have one of those darn MBAs myself, after all.) "Don't do it," Miles (our agent) told us on the conference call we set up that day to discuss this turn of events. "That's a bad road to go down. I steer all my clients away from those. It is my job as an agent to convince the publisher to take all the risk and not push any on the authors. Authors work in Word, not Excel." Just then I once again loved having a great literary agent. I'm not exactly sure how it works, but since Miles gets a cut of whatever revenue we get, it may have been in his self-interest to have us do the deal. We stitched together a brilliant Plan B that was inspired by the strategic mind game that goes on in high school cafeterias every homecoming season. (Run on sentence to follow - imagine the voice of a teenage girl reading it.) We would call back the first publisher who almost asked us to the dance but didn't come through and tell them that we now had another publisher on hold on the other line who is asking us if we are free that night. Oh, snap! The wild part is that it worked. The editorial buyer at the first big publishing house (I named her Maya in the earlier post) asked for another call with us. I have to admit feeling pretty pleased with myself as I got on the conference call with Maya and Mike (my co-author) the next day. After a bunch of pleasantries to reconnect since our last call with her months ago we got down to business. "Yes, we still like your book and are still interested in publishing your book, but we are going to need a buyback." Maya said. "*$%@!" Yada, yada, yada ... Miles sent our proposal on to a smaller publisher he thought highly of from previous dealings and they came back to us in two days with a written offer. No buyback, fair advance and royalty rates. Actually, I just wanted to use the Seinfeld 'yada' reference. I researched the new publishing house when Miles mentioned them. I really liked what I saw. Lots of interesting titles and authors in their catalog. The only real difference is that they only publish in paperback form. The other publishers were going to print us in hard cover ("cloth" is the fancy term they use for that, paperbacks are called "trade";). Hardcover is nice and all, but it does jack the retail price of the book up quite a bit. I actually like the idea of ours being more in the $15-ish price range than the $30-ish the other companies were going to price it at. After all, I did learn something about the relationship between demand and price when I got my own darn MBA. I want this one to sell more like beer at a ballgame than fine wine at a playhouse intermission. (That analogy looks a lot less clear now that I see it in words - I just mean I want to sell a ton of books.) All right, wrap this up VP. Got to save some writing for the 50,000 words you are now on deadline to produce. Stay tuned for a whole new phase of this journey!